Win a Third Day Naturals gift set! I have a fun little weekend giveaway for you from Third Day Naturals, a longtime friend of The Frugal Girl. 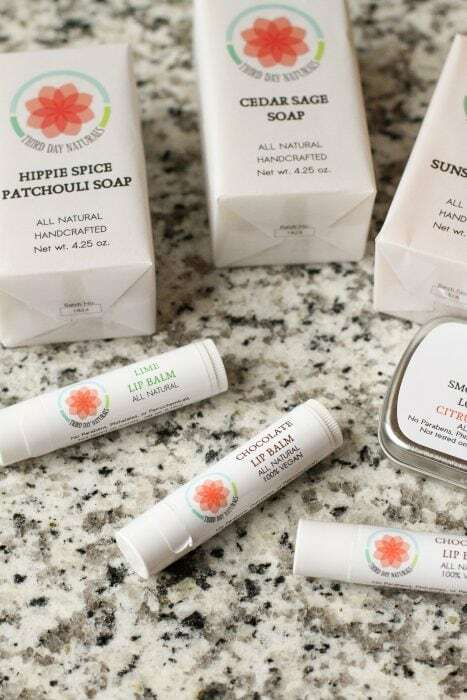 Run by a Frugal Girl reader and her husband, Third Day Naturals is a company that sells handmade soaps, lip balms, body butter, and other skin care products. Everything Third Day sells is made of natural, non-toxic ingredients, so you can feel good about putting their products on your skin. These are great for sensitive skin, and many of their products come in unscented versions, for those of you who have to be particularly careful about what you put on your skin. What’s in the giveaway package? Just leave a comment on this post telling me who you’d give this set to if you win. I’ll randomly choose a winner Monday morning and announce it in Monday’s post. Good luck! NO PURCHASE NECESSARY. Void where prohibited. Odds of winning depend upon number of entrants. « Freezer Challenge | Bones. Many bones. Probably split it up, some for me, some for my daughter in law. My brother and his wife love natural products, so I would definitely gift this to them. Wish me luck!!! Some for me, some for my daughter-in-law. LOVE this gift! I honestly would keep all of it. They look like fantastic products. For sure, I’ll keep this one. Oh, for my mother-in-law! Thanks for hosting the contest! I would give this to my daughter. She’s a no make-up wearing woman who loves natural ingredient products. I would give this to my eldest daughter who is lowering her ecological footprint. I would give to to my daughters. They look like great products! I would go into my stocking! I’ll probably give it to my mom, who has very sensitive skin. Thanks! Should I be ashamed to say I would keep for myself?! I have always wanted to try this product! we have lots of sensitive skin around here, I would keep some of it and give some to my mother. I would keep it for myself. I *might* share the soap with my hubby though. Probably split it up to use as small gifts for a few special people. Hi! Thanks for running this giveaway! I’d split in between my mom and myself! I would keep it! Thanks for hosting. As a mommy who hasn’t gotten anything for herself yet for Christmas, I’m saying MINE! My mamma would love it. I would split it up among my family so that everyone could try some of the products. I would totally keep this gift for myself, but share it with my daughter. My oldest daughter! She loves these types of scents. I MIGHT need to keep one bar. My daughter. She’s 14 and I think it would brighten up her day. I will be that person, I’d keep it for myself!! Thank you so much! I have four adult girls so I guess that I would share it! I’d split it with my sister!! I’d give it to my mom, who loves these sets. My mom. She would love this! My middle schooler would love this! Thank you so much for offering us the chance to try and win. Me and my daughter would share ! I would split this between my children for stocking stuffers probably. My husband will get the lip balm and I will shamelessly use the rest! What a generous giveaway! I would split it up…lip balm and jelly for my children, soap for me. Definitely would keep for me and my children. All of us have dry skin in the winter, at least three of us have somewhat sensitive skin, and I have a very sensitive nose that can’t handle scented anything anymore. I will give this to my husband and my daughter who are both sensitive to every skin product they have tried. Fingers crossed that this is “the” product we have been waiting for. Thank you!! These look amazing! I would share the goodies with my daughter- she’s 12 and really loves soaps and lip balms and I am super intrigued by the Healthy Jelly! Thank you for doing this! I would share some with my mom and keep a couple things for myself as a special treat! Thanks so much for doing a giveaway!!! I’d share with my mom and my sweet neighbor Maggie. <3 My what a delightful treat it would be! I’d either keep it or maybe give it to my mother in-law for her bday. Thanks! I would probably spread them out over a couple different friends. What a lovely giveaway! I would probably split mine up between my daughter and myself. The cedar sage sounds like an amazing scent!! For my best friend, who can’t use a lot of commercial skin products due to the ingredients! I’ll probably keep it for myself. They look like great products! I would use the products for my daughter Adeline. She has terribly sensitive skin and very dry in the winter. 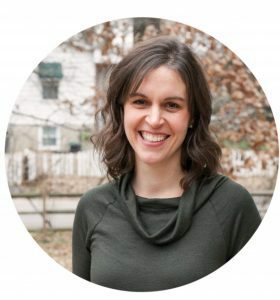 I am a sister in Christ to you and I am thrilled to finally find a sister in the Lord that cheerfully gives your testimony and what Jesus means to you, for all the world to read here on your website. It is refreshing to meet you (virtually) ! I will probably use your products myself because I have very sensitive skin and your products are natural and I believe my skin will take to these OK. I am also a Senior Citizen (age 68) but I am still actively working and play the piano for my church every Sunday and I have energy galore, praise God ! Your products packaging is very pretty and even before I knew you were a Christian, the name “Third Day” immediately made me think that you named this for Jesus’s resurrection on the Third Day, right ? Thank you for all of your hard work sharing your beautiful family’s experiences in living the frugal life, I need to learn much from you ! I’d give the set to my friend Kathleen who never buys anything for herself. Thanks for the introduction – I will have to check them out! Their products sound fabulous. I’d love to share this set with my 3 daughters. We like to use natural products, but buying them for 4 of us is not always easy. The lip balm is so nice. My 13 year old would “borrow” some for sure! I would love to try some other products. It has been hard around here with our baby being diagnosed with Cerebral Palsy. Trying to not let his condition limit him but the milestones have become inchstones. Each little thing is celebrated, he is our two pound miracle micropremie and some of the natural products would be great for his delicate skin! I would keep if for myself but share with my granddaughters when they come over! They love raiding my lip stuff even though they are only 4 and 2! I’d split it up between the 4 kiddos stockings. I would give some to my mom and keep some for me. Thank you. My nephew, who has really sensitive skin. I would split it up to share with others although I would keep the lip balm! I can’t go to sleep without it! This is great! I would definitely give it to my mom! I’d be interested too, but in the holiday spirit, she could have it. She’d have to give me a sniff though! I would share this with my momma!! Good luck everyone! Hmm, my sister in law would enjoy this, though I would too! Ha ha!! I would give this to my daughter’s fabulous kindergarten teacher! I would use some and share some with my daughter. What a great giveaway! I’d keep the lotion and lip products, but share the soaps with my mom. I’d keep the lotion and lip products, but share the soaps with my mom. Thanks! I think I would give it to myself. I don’t pamper myself very often so this would make a lovely gift for me. My sweetest and only friend is quite obsessed with cute little cosmetics, so no sooner that I saw this post then I thought about her! I’ll gift her the two soaps, the travel or stick lotion (since she’s the one who travels more than I do) and one of the lip balms; the rest is for me! I will definatley keep this for myself. I love natural cosmetics. Ok, I might split it with my mom and my brother’s girlfriend. She has really sensitive skin and would appreciate the body lotion. I’d treat my sister with this! I would share with my sister in law and my tiny person (niece). We all love feel good, smell good things! I would split it up among my sister, mom, and good friend! I would keep it for myself. I could use a little pampering! I would keep the lip balms or maybe everything! Stocking stuffers for my Framily! Well I think I would give it out to a few people. I have a friend that travels slot so she’d like the lotion. I would keep :). I want to try the Healthy Jelly. Totally keep for myself, no shame! No shame here, either. I’d probably use it myself … although the soaps might become part of the Xmas package for people I hire. I would gift this to my mom. She never buys fancy things for herself. I think I’d give this to my Mom for her birthday on January 6th! I love good soaps, so probably some for me, something for my daughter, something for a friend. Great giveaway. Thanks for the chance. I would give it to my daughter but keep a lip balm for myself. probably split it up and share some with my wife. I think I would keep it for myself! Sorry! This would totally go in my own stocking! I would keep it for myself. Of course, I would have to try it out before I could give it away. I admit, I would keep most of it for myself. I would definitely send a lip balm and bar of soap over to my mom so that she could try it too. My very dry winter skin is intrigued by this “healthy jelly” though! I would share with my bestie! Thanks for the giveaway! I’d probably keep some of it for me (just being honest!!) and maybe give some of it to either my daughter or my sister in law. It would be so fun to get to try these things! I would split this fun gift between my daughter and my son’s girlfriend. I’m thankful for company’s like Third Day Naturals! I would split it between my kids and me! I have three sisters. These would make great little stocking stuffers for them. I think I’d split it up between my sisters! I would probably keep all of it. i have really sensitive skin. Oh my goodness, I’m not typically selfish, but I’m keeping this gift for myself!!!! Thanks! I’d gift this to my mom for sure. After a few really tough life changing years she’s still committed to using all natural products (even though it is a tough call financially for her). She deserves the best! I would split it between my daughters! I would keep the lotion and soap and give the lip balms and Healthy Jelly to my daughter, a lip gloss junkie. I would keep the healthy jelly for my baby girl and gift my sister-in-law with the other stuff. She loves trying natural, handmade products! It always tickles me, where do all these commenters come from on giveaway days? Your comments quadruple on these days. I won’t win so I won’t have to decide who to give it to but I enjoy your blog. I think the answer to your question is that most blogs have many, many more readers than commenters given the time it takes to think about, compose & post a response. On a positive note, offering an incentive highlights this fact to the blog host. Their words & readers’ comments have a much far-reaching audience than may be obvious on a typical day. I would share this with my mother-in-law and a friend! I’d be split up between multiple people. The lip balm would definitely go to my SO and the healthy jelly to his mom. I might stash the lotion bar in my desk at work and the soap would go in our own bathroom. It’s a small luxury to have handmade soaps for our showers. I’d split it with mys sister. Well… I’d like to keep it for myself, but I suppose I could give it away. Maybe to a friend. I would give it to my youngest granddaughters, who have sensitive skin. Love natural soaps and products! I would love to share this with one of my cousins who enjoys natural products with minimal waste. Not sure if I can enter because I’m in Canada? I’d give it to my daughter because she loves all natural products. Looks absolutely lovely! I’ll spread the wealth will probably keep the lip jelly for me, because, winter. I would share it with my sister! I would happily share with my daughter! My sister who just gave birth to her first and my daughter who can’t use anything petroleum based. I would keep it for myself. I live in the northland and winter is hard on my already dry skin. I’m always trying new things. Thanks for the opportunity. I would split it up for stocking stuffers. I would split it with my daughter. I would keep this for myself. I have very dry skin and would love to try these products. I would split it between myself and my granddaughter. I would share this between my daughter and daughter in law. I would give it to my husband and nearly five-year-old daughter. My husband loves fancy soaps, but they’ve been struck from our budget for the foreseeable future. My daughter just loves anything fancy. Probably a little of both – some for me, some for my mom. I’d share with a friend! I would treat my new mother daughter. I would wrap it up and gently and lovingly insert it into MY OWN Christmas stocking Thanks and happy holidays! I’d share with a friend and my sister-in-law! I’d totally “give” this to myself! I would give this to my best friend who just had her first baby! My husband who has sensitive skin. I would give these to myself and my daughters! Thank you and Merry Christmas! If I got this, I’d keep it. My birthday was recent, and unfortunately was completely forgotten by family/friends as was sick so I didn’t even get to have a birthday dinner. So this would be a lovely make-up gift for me! I honestly would use it for myself However, looking for a reputable, small business place for natural soap, so will probably buy even if I don’t win. For my farmer dad – who is always outside and has really dry skin. Thanks for offering this! My neighbor who lives on a limited income, and she likes natural products. My neighbor who lives on a limited income, and she likes natural items. My scent-averse husband would really love some unscented stuff ! Whoa… I didn’t read through all 105 comments but suffice to say, these items certainly seem to be appealing based on the number of responses. Honestly, who wouldn’t like natural products without chemicals? My 17 yo DD is into natural everything from personal hygiene items to vegan food items. She shunned items containing parabens years ago when I had no clue what a paraben even was! She has recently become serious about all natural skin care items, so without a doubt these items would go to her. Although I’ll be honest, I could probably get her to share at least 1 item with her old Mom. That’s the kind of DD she is with a much broader thought process than I ever had. Thank you for hosting this awesome contest & to the reader for providing her products. Happy holidays to all. I would split it between me and my friend. I would love it, but I would give it to one of my daughters! I would love to stuff MY stocking with these products. I love their soaps so I would probably keep those and use the rest as stocking stuffers. Maybe all to our eldest – she’s tough to buy gifts for now-a-days. I would definitely keep at least one soap for myself. The rest I might give to one of my dear friends who always finds ways to serve me. I think I would divide it up between my 4 kids! Perfect sizes for stocking stuffers! I would probably keep it for myself and my partner. We try to use all natural products with low/reusable packaging, and I’m not familiar with this brand so it’d be exciting to try something new! I would probably give some to my husband and also use some myself. We love natural products! I would divide up the soaps between my stocking and my daughter’s stocking. I love beautiful scented soaps. I would split it between me and my sister. I would keep the lip balm and give the rest to my Mom! I honestly can’t decide whether I’d use it or save it to give to my step mom for her January birthday. We both have ridiculously sensitive skin and often recommend and/or gift safe brands to each other. I would give this gift set to my best friend of 23 years! She is going through a rough time right now and I just love her so much. Thanks to you and Third Day for hosting this giveaway! My mother-in-law would be the perfect recipient. She tries to use all natural products as much as she can. I’d give it to my sister. She’s really into natural products and doesn’t have a lot of money to splurge on herself because she’s going through the in-vitro process right now. I keep some for myself and gift a couple of items to my friend! To be honest, I’d probably keep it! I would probably keep some for myself and share some with my mom! oh. that cedar sage soap may have to be mine – but the rest i would give to my scent challenged friend! I will split with my 12 year old daughter. My 13 year old daughter would love this! If I love the scent, I may not share. My daughter would get this!!!! I would split it between my daughters. I’ve been wanting to try this, so I’d definitely give it to myself! Chocolate lip balm?! I would definitely keep that for myself! But these would make great stocking stuffers for my family! We could all use a little more all-natural products in our lives! Hmm, I think my elder daughter would get the lip balm I would take the soaps and the younger daughter would get the natural Vaseline. I am addicted to lip balm so I’d probably keep those. The rest I would package up as part of a hostess gift for my cousin whom we stay with for the holidays! I’d give it to my friend who is beginning treatments for cancer. I would keep it for myself. I never get anything for me. I have no shame in saying this !! I would divide it between my son and my husband. My son loves their soaps and my husband says their lip balm is great. I would selfishly keep it all for me. No sense in lying about it! Oops, I commented on the wrong post to enter to win. So, I’ll repeat myself here….I’d give these great products to my Mom. I’d love to keep some for myself and give some to my cousins. I’d give to one of the sweet ladies in my life: either my mom, my daughter, or my daughter -in-law! Maybe some for my niece who has some eczema issues, or maybe for me! How fun! I’d gift this set to my sister. If probably use as stocking stuffers! I’d give the products to my daughter who is living on her own for the first time. She’s done a great job the past seven months and I’d like to recognize her for it. I would give to my sister. She is just recovering from breast cancer, and has changed everything in her life to be more holistic- eating, mental, physical. She is recovering very nicely (stage 3 cancer at age 46). I truly believ her healing has come from becoming more natural in all aspects of her life. She is truly an inspiration! I would divide it up in the stockings for various kiddos! Thank you for the opportunity to win this lovely package! I would share with my daughter. I would probably share it with my daughter…. I would give this to my daughter who recently moved far away and will not be with any family for Christmas. This would be a wonderful gift for her! I would probably split it with my mom…. Thanks! Hi there! What a delightful giveaway. 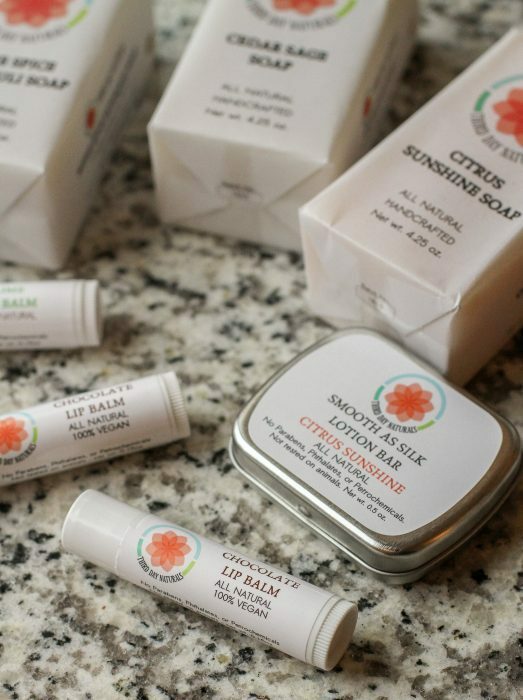 I would probably snag a lip balm for myself and then divvy up the rest for stocking stuffers…. our daughter and daughter-in-law. Most to my 11 yr old granddaughter, who is just beginning to be aware of what she puts on her body. I would gift it to my daughter. She has very sensitive skin and it just gets worse in the winter so she would enjoy it very much. I’d split it up between me, my mom, and my sister. A soap & a lip balm for me, the rest into Christmas stockings Making these types of products is on my to-do list for someday. In this meantime, I love finding new companies that are carrying out the things I don’t have time for in this again if my life! I’ll for sure be checking out Third Day Naturals! Apparently I don’t have time for proofreading in this *season of my life* either. Oooph. Slow down. I’d love to win this to share with my daughters! The three of us have such sensitive skin, but I love trying different products. As I have sensitive and eczema-prone skin, I’d probably give this set to myself ;-), but I’d share a bit with my hubby and two teenage daughters. I think that between my kids, husband, and myself it’d stay at our house. If anyone gets a piece outside of that it would be my mom! I would give it to my daughter. She is very good about using only natural/safe beauty products. Definitely, would split it up into stocking stuffers. I love Third Naturals’ Lip balm, it’s amazing! I would absolutely share this gift with my mom and sister. I’m very interested in this for myself. I’d also give a bit to my mom, who would also appreciate it! I would share it with my husband and son. My husband likes soapbinstrsd of body wash, and my son has very dry lips from a medication he’s taking. Thanks! My son. He has such sensitive skin. Thank you! Oh my…it would be hard to give this away! Though I would be willing to share some of it with my family. For me and my daughter! We enjoy the soaps and would probably keep some of the products and give the rest to one of our daughters. I’m a med student wife on a very tight budget! I’d keep most for our family but share one or two as Christmas gifts for my mother in law. I would keep some and share some. I am interested in the jelly. I would give it to my daughter. She is getting married in a few months and loves natural products. Thank you. I’d probably divvy it up between my kids and myself -I love the variety of scents. My stepmom would love these! I would divide the gifts up and keep one for myself . Thank you! This would go to me! Perfect for my stocking! I would keep this for me. I would gift it for my kiddos! Some for CrossFit friend Mandy and some for me. I would keep most for myself! And probably share some with my son’s girlfriend. I have three boys, so having a girl to buy for for the first time (other than nieces) is different this year! For me and my husband. He uses lip balm regularly. I would put them in my three daughter in law’s stockings for Christmas. I love that this set can be easily split in two! I’d split it between my two daughters. I think I would most likely keep this for myself. Sounds too good for me to pass up. I’d probably split it up between me, my mom, and my sister. If I’m being honest, I’d probably keep this for myself. I’ve been wanting to try their products and simply haven’t made it a priority. I have given these products as gifts before so this time I would keep it for myself! Hmm… I would probably keep it. I have four kids and two of them have excema and need more natural products. I might give some to my father-in-law because he has auto-immune issues and also is very careful about additives in skin care (as well as food). Ahem. That is supposed to say ECZEMA! I would give it to my dd and her husband for Christmas. I’d share them with my daughters! I think my own lips need a little love. I would keep and enjoy these natural products. It’s been several months of saying lots of ‘nos’ in order to say ‘yes’ to better things. I would allow myself to enjoy this gift. Thanks for the change to win! I enjoy your posts and sometimes odd meals that I can relate to. You keep it real. Keep it coming! I would give it to my mother in her stocking. She is the most selfless person I know, and she would never buy “fancy” products for herself. 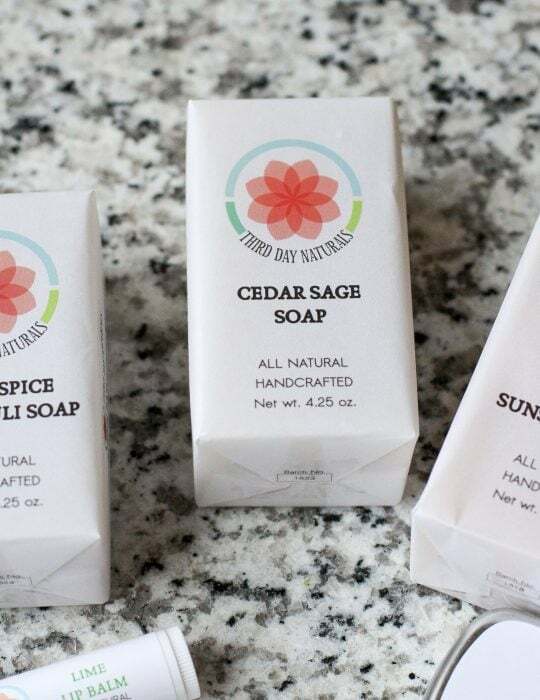 I would keep one soap for myself and then share the rest of these natural products with my friend who just finished successful treatment for breast cancer. She has been transitioning to non-toxic beauty products. Merry Christmas! I would share them as stocking stuffers for my family this Christmas. I’d give this set to a very special dyslexia teacher! I would probably give it to one of my three daughters so I could “borrow” some of the items. It’s been a tough couple of months- broken water line ($4000), DH’s car totalled when he was rear-ended and side swiped, my car needing major work when I broke down 535 miles from home, and more! It would be nice to have a little treat for myself! I would slit it and give half to each of my beautiful daughter in laws. I would totally keep this for myself. A mix of people–I want the lip balm and I’d probably give the soap to my Mum (depending on the scents). I may keep some because I like trying new products. And some would be given away as “just because” to friends as a sweet surprise. How nice! I’ve never seen a lotion bar. My mom would love the soaps and My daughter and I would love the lip balms, so I’d divide it. I would give it to my daughter because she dosent wear makeup but she would love this! I think I’d have to split it up among a few family members! I would keep the lip balms for myself, but I would share the rest with my family! I would have to keep this all for myself!! I would share these with my tween-age daughter. I love natural skincare products! I would give this to my BFF, maybe keep a lip balm for me! Totally giving it to ME. 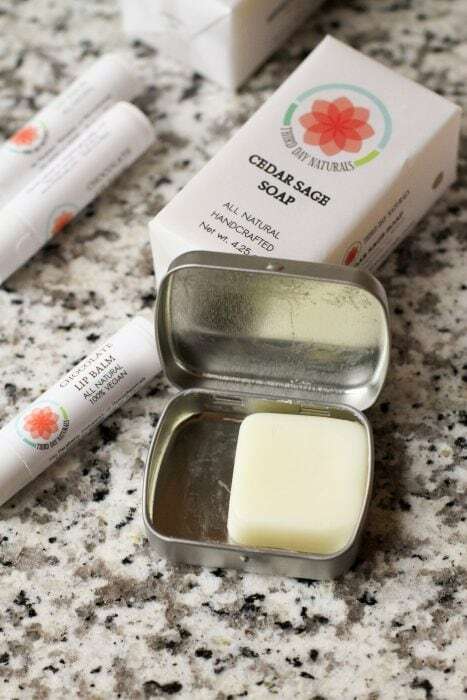 The cedar and sage sounds fabulous, right up my alley. I’ve herd you talk about this brand before. I would love to win it and I would share it with my 2 daughters also. I selfishly would love to keep it for myself. It would be a nice treat. I’d split it with my daughter. I would wrap it up and send it to Sophie, the incredible CNA who looked after my mom in hospice care. She didn’t just do her job, she made sure the RNs were never late with my mom’s pain meds and somehow managed to make Mom smile, even on the bad days. I had planned to make her a “pamper yourself” basket and this would be perfect. I would give it to my MIL, as she loves natural products and is always using lip gloss and hand lotion. I’d love to keep the soaps for myself, but I would share the lip balms and healthy jelly with my parents. They live in a humid climate, and when they come to visit me in my very dry climate, they have a lot of trouble with cracked lips and cracked skin! This would be perfect to share with them when they come for Christmas. Thank you for offering this fun set for us to win! I’d love to tuck this into a gift basket for my mom. I could use more lip balm right about now! These items would make the prefect stocking stuffers for my in-laws. I am trying to introduce them to more natural products so this would be a great win! I would share it with my sister. We love this kind of stuff, and it always more fun to share! I would share some with my daughter! I’d give this to my mother and happily use some when I’m over! If I were to win this, I’d definitely keep it for myself!!! I’d keep some for me and give some to my mother-in-law. Oh what fun! I would give it to my law student daughter who could use some pampering! I would give it to my law student daughter who could use some pampering! My daughter and I would both put it to good use! I would likely keep most of it because it is winter in Michigan and my skin could use some TLC. Hi Kristen! I would give this lovely set to my college student. She has little money for beautiful things like these handmade goodies! I would share it with my mom! I would probably split it between my sister and I.
I would share the set with my mom who has been caring for my step-father with cancer…she needs a little pampering. I would give it to my daughter and sons they would love it and my mom too! I would spilt them up with my my two daughters and myself. A friend of mine in grad school is going through a tough time, I would gift this to her in a self care package! My daughter. Because she is too young for makeup and perfume, she loves to try new lip balm and lotion. I would split it up between my son, daughter, and myself. Perfect timing – the local shop where I buy all my lip balm burned down so I’ve been on the look out for a replacement. I’d give these to my daughter and buy some additional lip balms for myself! I would keep it! Over the past year or two I have had so many bad allergic reactions to products that I would love to try it to see if it is something my skin wouldn’t react to. I also love citrus it just boosts my mood! I’m always getting the cool stuff to give to other people. This time, I’d like to keep it for myself. The scents sound wonderful! I’d give it to my neighbor. I’d use it on my kids! Stocking stuffers for daughter and daughter in law. I would give it to my newest sister. My family has a long history of adopting the best friends of our sisters, and our newest one was recently adopted, is new in town and could use all the love! Such a generous giveaway! It would be great to split between myself and my sisters. I would give it to my 13 year old daughter, who is a vegetarian and would love it! I would share with family! I’d sHare with My husband and keep some for myself. Thank you! I think I would give this to my daughter-in-law and that would finish up my Christmas shopping. My daughter who has sensitive skin. I would keep it for me! I’ve been wanting a natural soap for my face. The rest sounds interesting too. What a thoughtful giveaway! Not to sound selfish but I would probably keep this for myself. I am disabled and so is my roommate and these products sound like they could benefit each of us so much. I would keep it for myself and share with my family. I’d split it up and give some to my mom and keep some for myself! I would split it between my family. I would give it to my daughter. She loves natural skincare products. I’d probably give it to my future mother in law for her upcoming birthday… I don’t have a gift yet! I will give most away to friends & keep a lip balm! Ooooo, I’d LOVE to keep this for myself, but would end up gifting it to my nieces! I would give it to my daughter who has very sensitive skin and struggles to find products she can use. I would keep part and give part away. Their Healthy Jelly is wonderful! I’d keep it – the stick lotion would make packing for air travel so much easier, and I do a fair amount of that this time of year. Me!! I’d give it to me… my daughter would probably swipe some… but me!! I would give it to me!! I love the idea of pampering myself with handmade soaps and lotions!! I would keep the lip balms for myself. I would split the rest between my 2 daughters. I would keep it so I can try the products! I’d share with mom and sis! I would give this set to my pregnant daughter. She’s trying to use as much natural products as possible. Since she’s a stay at home mom to a two year old budget is tight. What a blessing this would be! I would probably keep some and share some with my kiddos. I would keep split it between me, my mom and my daughter. I’m trying to teach my 16yr old daughter about all natural alternatives in some products and the benefits of that. I would actually give it to my husband because he loves fancy bar soaps and lip balm. I would split between my sister, my daughter, her daughter, but I would occasionally use my daughter’s :)! I’d give it to my mom! She has the most sensitive skins. I would split it up between myself and my daughter in law, who only uses products with natural ingredients. Thank you! It would be a fun stocking stuffer (for me!) but my 3 year olds would love lotion sticks! I would probably split it up between my daughter, my mother, and myself. I would create a win-win situation in which I get to keep the soap and divy the rest of the products amongst my family. I would probably give to one of my cousins, who loves that kind of stuff. This would go to my daughter! I would split it and share with my daughter. I have to admit that I would totally keep it for myself. My little sister is allergic to propylene glycol, which you don’t realize is in everything (seriously, shampoo to ice cream) until you have to avoid it. I’d give it to her. Definitely for my sister! She lives in dry, dry Colorado! I have sensitive skin and would try these myself! I would give this to one of my friends who is expecting her third child. I’d love to give this to my mother. Thanks for the chance to win. My daughter, who is allergic to everything. I would treat myself to this wonderful gift! It’s go to my best friend who’s always giving so much to everyone else.